We are a big table-top game family and often spend our Sunday evenings playing different games together. I think it’s a great way to pass the time and enjoy each others company without the use of the TV! 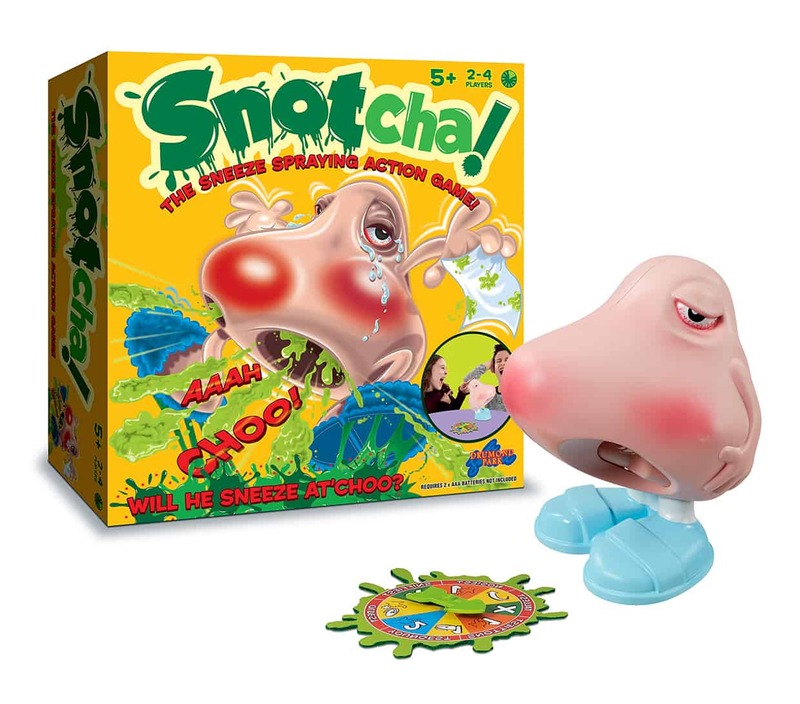 The latest game we have been playing has been Snotcha which is a really simple and fun game for the whole family. 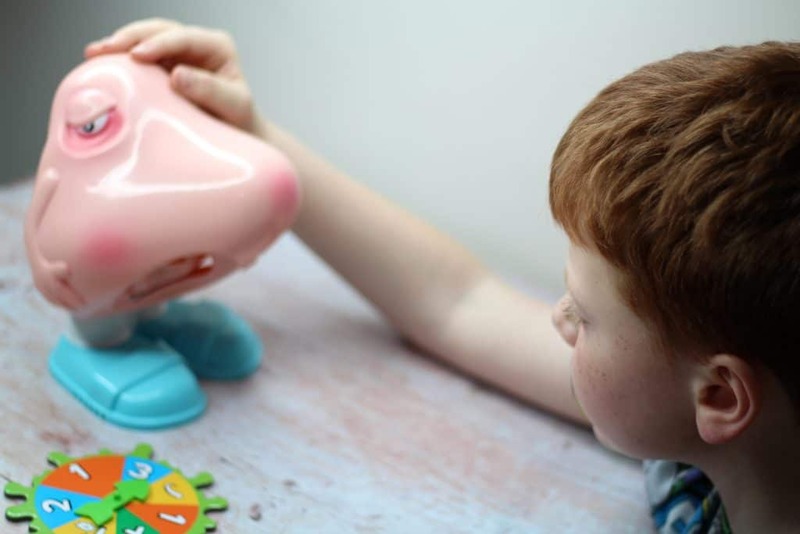 Snotcha is a highly entertaining game for 2-4 players aged 5 years+. The game is so simple to play which makes it ideal for younger families as there are no difficult rules to explain and follow. You simply turn Snotcha to whoever’s turn it is and they turn the spinner to reveal how many times they have to push down his nose. Will you stay dry or will you be unlucky enough to get sneezed on? If you are unfortunate to get covered in a wet sneeze you are out for the rest of the round. The remaining players keep going until only one player is left. This is one of those tension rising games that has everyone falling about in fits of giggles. It is nerve racking pressing down the Snotcha nose not knowing if a sneeze will be released! Putting Snotcha together and packing him away is really easy. It’s worth pressing down the nose a few times before you start to get the water moving through the system. After that you are good to go and ready to play. Make sure that you empty the water chamber after you’ve finished playing and allow it to fully dry before packing away. As a family, we really enjoyed the fun factor that accompanied Snotcha. It’s nice to play a game that is simple to understand but still really fun to play. Henry found the game highly entertaining and was very excited to see if Snotcha was going to sneeze! I like games that are easy to set up and get on with and Snotcha certainly ticks that box. It comes in a sturdy box to pack everything away in when you are done which makes storing the game and keeping everything together so easy. We played the game with two players and four and it’s just as fun no matter how many people play. I think this will be a real hit over the festive period and sure to create lots of giggles and laughter especially amongst the younger audience! Do you think you and your family would enjoy the fun and adventure of Snotcha? Drumond Park have kindly offered to give one of you lucky readers your very own Snotcha game! Enter using the widget below! If you want to find out more don’t forget to stop by the Drumond Park website here. Drumond Park also have a blog where you can learn about similar games that might interest you – check that out here. Thank you so much for stopping by! If you want to check out some other great reviews don’t forget to head over here. More great giveaways can be found here! *I received Snotcha from Drumond Park on a gifting basis in return for an honest review. As always all words, opinions and views are my own. For more information on any of this please head over to this page.